Holidays are a very interesting time if you work in technology leadership or support. Ideally, people want to have some time-off. Therefore, making a list of essential projects to finish starts months before the holiday plans. Then a list of “what to do if” scenarios needs to be created and shared with whomever is going to be covering the campus/organization/service/website etc. If you are like me, you are always prepared to remotely assist, even during times of rest and relaxation. The fact is critical processes can fail, and when they fail, a team effort is required to bring the world back online and settle the chaos. My expectations for having to spend time-off supporting my campus connect directly to events that are unplanned, or mistakes in planning I have made. I do not expect to be contacted with an urgent request, have to leave my plans and find a laptop, and then fix something that is a problem inside of the local infrastructure. In other words, I do not want to get a phone call because someones chair is broken or printer is out of ink. Many years ago I realized that for some reason people who do IT Support seem to follow patterns (almost blindly). They repeat the same steps all the time, without actually diagnosing cause. They treat the symptoms and not the disease. In addition, IT Support people make assumptions about users as well. The assumptions often lead to inaction or the repeating of useless actions, without any consideration of the actual situations. In 2009, I instituted a simple rule on my campus. When anyone, myself included, walks into a classroom or office, go straight to the connection point in the room and Start At The Wall. 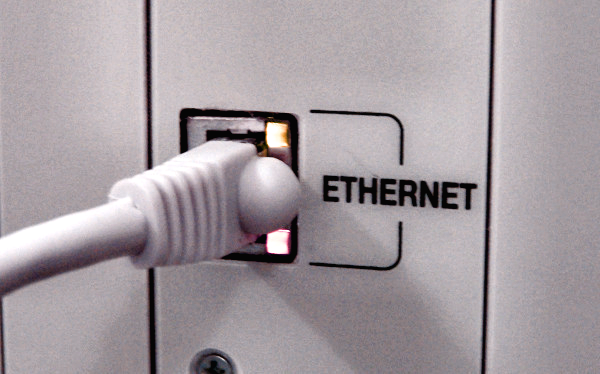 If a classroom or office uses Ethernet (pictured above), always check the cable first and walk socket. If the user is on Wifi, inspect the work area and power, and also if possible, visually inspect with Wifi Access Point. The rule states that even if the problem is simply a question, take 30 seconds to inspect the source of communication and power in any and every space and look at the workspace. IT support people very infrequently connect to an individual user in the user’s space. In a given semester, support might enter a given teacher’s classroom or other user’s space just a few times. Therefore, every time IT support enters a room they should be observant and looking for any issues, which include simple maintenance problems, that a user may not notice. Starting at the wall also has the benefit of focusing the mind. When a person goes into a space, their assumptions take a backseat to the job and process they are following. Panic. Irrational judgement. Defeat. Only bad things can happen. In fact, in a recent case during my time-off, IT Support made an assumption that the problem was not only unsolvable by local means, it was completely external. Meaning, there was nothing they could do to solve it. They tested the issue in 3 laptops, with the same exact results, and never once considered the issue could be something on the local network. This assumption should have been avoided, as they had an email from 24 hours before explaining that the system in question had been successfully tested by a third party (off-campus), and the performance was normal. They were so convinced, that even after the problem was tested off-campus and visual confirmation was provided that the services in question were working fine, e-mails flew reconfirming the problem still existed. I inferred from the emails that they believed I was using the system by some mystical means, which would prevent me from seeing the same results they were seeing. The fact is, once people believe in a cause, justified or not, getting them to let go of that belief is extremely difficult. Not following some initial simple steps, can lead to conclusions that make bad problems worse. All school administrators should be aware of their campus IT support processes and procedures. People tend to disconnect from IT support and see it as a black-hole of mystery, and they just hope that it will work. This entry was posted in Educational Technology, Helpful Tips, Opinion, Tony DePrato, Uncategorized and tagged process, support, technology. Bookmark the permalink.